For years people have struggled with the best way to capture and share dialog boxes or other objects they see on their computer screen. The PrtScn button by default captures the entire desktop, and using Alt+PrtScn captures only the active window on the desktop. This is a good start to get what you want captured. You can then open the Microsoft Paint application (mspaint) and paste in what you have captured. The trick here is to make the area in Paint that you’re about to paste into smaller than what you are pasting, this way the resulting image will be exactly what you captured and not have any white space. This works fine, but what if you want more than one window, but not the whole desktop? You have to capture the whole desktop, paste it into Paint, then select just the area you want, copy that, create a new instance of Paint and paste it in. So, it can be done… but it’s tedious. The obscurity of this process and the desire to have more functionality has led many people to purchase 3rd party software like Snagit. While these 3rd party tools aren't that expensive and provide a lot of functionality, I think many people end up purchasing them just for basic functionality. 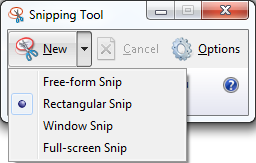 With Windows Vista and Windows 7, Microsoft includes a handy utility for screen capture called the Snipping Tool. It's installed by default in almost all versions of Vista and 7, other than the basic and lower editions. Its part of the “Tablet PC Components” so if you can’t find it, be sure those components are installed under Windows Features. The easiest way to launch the Snipping Tool is to use Windows Vista and Windows 7’s built in search. Click the Start Button, type in “snip” and it should be at or near the top of the list. Or, if you really just want to go to it, it sits under All Programs, Accessories. With Windows Vista, probably the first thing I like to change is that by default all captures have a red ink boarder. So if you uncheck the "Show selection ink after snips are captured”, that won’t happen anymore. In Windows 7, this is unchecked by default. Also, here lies another neat feature. 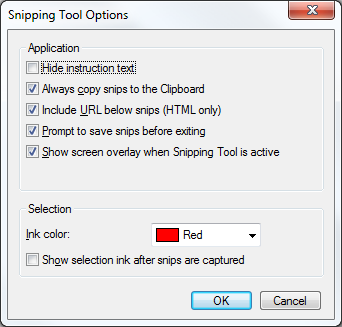 By default the Snipping Tool is set to “Always copy snips to the Clipboard”. With this, if you really just want to paste what you’ve captured into another program, you don’t have to save the capture first because it’s already in the Clipboard. For example, you can snip something and then just paste it into an IM conversation or email to share it with someone. Editing tools after capture are fairly limited. 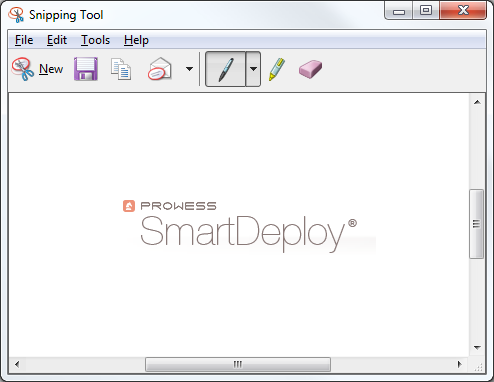 You can highlight, use a pen to draw, or directly email the capture. Beyond this is where you would really need a more fully functional 3rd party application if you wanted to resize, add text, or other graphics. In Windows Vista both Paint and the Snipping Tool default to saving their files as JPEG’s. However, in Windows 7 they have switched both to default to PNG’s. Microsoft has always bounced back and forth on this, but I prefer PNG’s, so I like that they have gone that direction with Windows 7.